In part one, I talked about some of my experiences with and the reasons for using podcasts in the classroom. This week, I will show you some uses, tips, and tools for using podcasts. Let’s face it. Sometimes our students are disconnected and board when learning new content. Podcasts allow students to connect the lessons they are learning to the outside world. Several shows like Radiolab (Science, Math, and History,) This American Life (Literature, Social Sciences, Storytelling, etc.,) Stuff You Missed in History (Social Sciences), Planet Money (Economics, Math,) etc. offer many different educational opportunities for any grade level and class. When my students read Night, we listen to the episode “Abdi and the Golden Ticket” from This American Life to connect the Universal Declaration of Human Rights to modern issues. We also listen to the “Bad Show” clip, “How Do You Solve a Problem like Fritz Haber,” because of its connection to Auschwitz and Night. When students are able to see real-world connections with the lessons they are learning, they want to do more. Students and classes can make podcasts to show what they learn. If students make podcasts, it gets them to think critically, write for different audiences, collaborate with others, and gets them to work at a level of rigor and differentiation teachers look for. Student podcasts can be very short (1 minute) or feature length (30+ minutes). What is great about content creation is that students can start a content library for future classes. Students can conduct interviews with each other as themselves or as characters, do book talks about stories or novels read for class, teach others how to do math problems or science experiments (video podcasts are great for this), create a portfolio of information for outside listeners (my former psychology students did this), etc. There is no end to the possibilities. For example, my younger sister is an upper elementary school science teacher. While teaching 5th grade, she used a clip from the show Radiolab to introduce her podcast creation project for her students. The 11-ish minute clip, “Glad Somebody Likes Bugs,” focused on botfly larva and used techniques that involved creative storytelling, music, sounds, etc. The first year she used it was towards the end of her unit on cells. She wanted her students to create interview-style podcasts about different parts of the cell. When introducing the project, she explained to her students that their podcasts needed to create a picture of their subject, an assigned cell part, for their audience. The cell part being interviewed had to be “seen” in the audio. She played the clip to show how this could be done. None of her students knew what a botfly larva looked like, and the clip created a picture in their head that made them “see” the larva while listening. After discussing what made the clip do this, her fifth graders began a multi-step process to create their one-minute podcasts: research, story structure, drafting a script, teacher approval, rehearsals, and recording on my sister’s phone (transferred to her school desktop). They would listen to the different podcasts and fill in a graphic organizer to use later for their unit test. The podcasts were accessible on her school website so they would have it to review. This became a favorite of her class. The next school year, she used the same lesson during her unit on insects. Programs like Audacity or Garageband allow you to record and edit in their programs, but for the needs of your students, it may be easier to record the files on their phones or devices. With most earbuds coming with microphones, this is helpful for recording. You need to make sure the files either end with .mp3, .mp4, or .wav.) When it is time for students to edit, teachers may need to be there to help. Audacity and Garageband are free and can be easy to use after some practice. My class uses Audacity because I have experience with it and can help when needed. The EdTech Teacher website has a great list of recording and editing apps that would fit your classroom needs. For hosting, my class uploads to our class Soundcloud or YouTube. When using Soundcloud, it is free up to 3 hours of audio, which fits the needs of my classes. YouTube is easy because you can upload a video file created with an image using Microsoft Movie Maker on PC or iMovie on Mac. If YouTube is banned at your school, you can also use Vimeo or TeacherTube to upload your files. Another option is Google Drive and Pod Bean. Always Listen First: Most podcasts are edited for cursing, but sometimes it is not. Always listen so that you can decide if you need to mute or skip certain parts. Know your audience: Don’t play a high school level show for younger kids. You know what your students can handle. Start with clips: It introduces the idea of podcasts to your classes and helps keep their attention. Provide Transcripts: I always have transcripts available for my visual learners or those who may need it (i.e. IEPs). 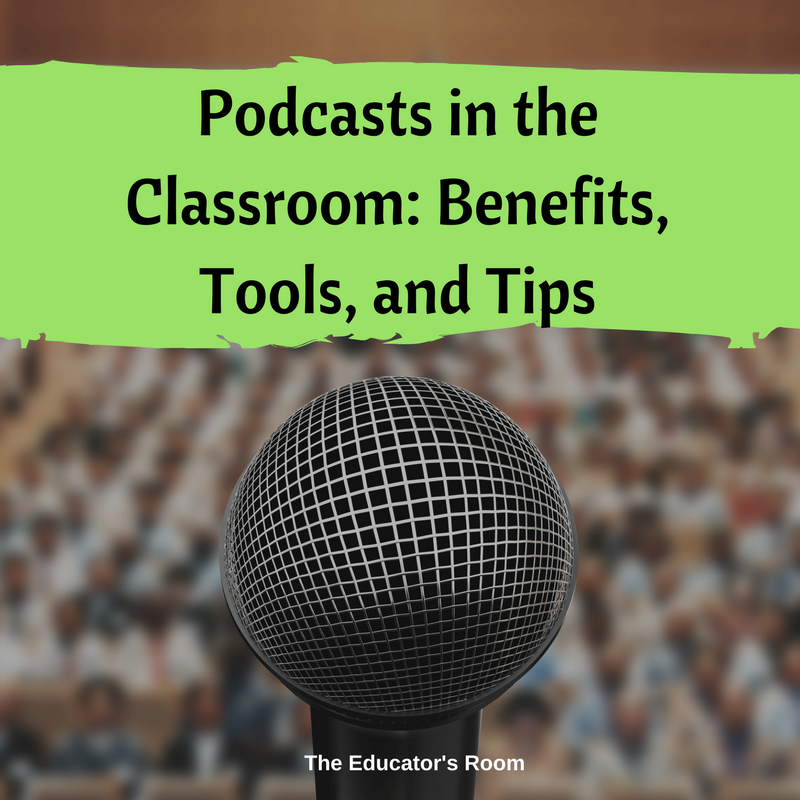 Hopefully, this helps you get started on the path towards using podcasts in your classroom. Podcasts can make your class more interesting and allow your students to work with new media. It is up to you how far your classes can go with podcasts. If you have any questions, feel free to reach out to me via email (sarah.denham416@gmail.com) or on Twitter (@EdTechieSarah).